The U.S. Department of Energy's Office of Civilian Radioactive Waste Management announced December 23, 2003, that the program has identified the Caliente rail corridor as its preference for construction of a rail line to serve the Yucca Mountain Repository in Nevada. At this time, the Department also has identified Carlin as the secondary preferred corridor. 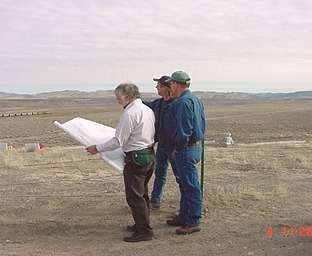 Eureka County Transportation Impact Specialist Rick Moore, Lumos engineer Tom Young, and Crescent Valley resident Joseph Carruthers (l-r) tour the proposed Carlin rail route corridor near Beowawe in December. The Carlin route is DOE’s second choice if the Caliente route is infeasible. The Caliente rail corridor was one of five studied by the Department of Energy in its Final Environmental Impact Statement (EIS) for the Yucca Mountain Project. Three of the five potential corridors, Caliente, Caliente-Chalk Mountain, and Carlin, would approach Yucca Mountain from the north of the Nellis Air Force Range. Two southern corridors, Jean and Valley-Modified, would run through the Las Vegas Valley. The attributes of the Caliente and Carlin corridors, including their more remote location and the reduced likelihood of land use conflicts, appear to best assure the safe, secure, and timely transport of materials to Yucca Mountain. The identification of five potential corridors in the Final EIS was preceded by publication of a Draft EIS and a comment process that lasted more than six months and included 21 public hearings. The Department received approximately 12,900 comments on a wide variety of issues, including the five potential rail corridors in Nevada. The Department carefully considered these comments in developing the rail corridor preference. Having now identified its preferred corridor, the Department intends to proceed with selection of a mode of transportation and, if it selects "mostly rail" as the transportation mode in Nevada, with actual selection of a corridor no sooner than 30 days from publication of the announcement in the Federal Register. These selections will also be published in the Federal Register in a Record of Decision. If the Department proceeds with mostly rail in Nevada and makes a corridor selection, the Department will publish a Notice of Intent to develop an EIS on the specific railway alignment within the corridor. In connection with any such EIS, the Department will solicit public comment through an EIS scoping process. No actual construction of a rail line within the selected corridor can take place until completion of this process, which is expected to take several years. No waste will be transported to the repository until 2010, when the Department anticipates that it will have received a license from the Nuclear Regulatory Commission to open the repository. WASHINGTON -- The Energy Department has asked permission to reserve use of 308,600 acres of public land across rural Nevada to develop a railroad corridor to the proposed nuclear waste repository at Yucca Mountain. DOE officials filed an application Dec. 19 with the Bureau of Land Management seeking to withdraw a mile-wide swath of federally managed land along more than 300 miles encompassing parts of Lincoln, Esmeralda and Nye counties. The Energy Department announced last week that the corridor, originating at a Union Pacific Railroad junction near Caliente, 150 miles northeast of Las Vegas, was its preferred choice for a new rail line to haul spent nuclear fuel to the Yucca site. DOE officials said they planned to initiate an environmental impact study to determine specific rail alignments within the corridor to the repository site. Meanwhile, a Nevada-hired transportation expert said he did not think DOE could build a railroad line across challenging terrain without skyrocketing costs and years of delay. DOE has estimated it could build a 319-mile railroad in 46 months at a cost of $880 million in 2001 dollars. Robert Halstead, a Wisconsin-based consultant, said Nevada officials have estimated costs at $2.6 billion and a completion timeline of 10 years or longer. "Caliente is a really tough choice. I've been saying this for years," Halstead said. A formal notice of DOE's land withdrawal application was published December 29 in the Federal Register, initiating a 90-day public comment period. The Bureau of Land Management also plans to hold a public hearing on the matter, but a date has not been set. Dennis Samuelson, a BLM realty specialist in Reno, said the Interior secretary will decide on DOE's request after environmental studies are completed. BLM has segregated the land for two years, forbidding new mining claims to be filed on it and preventing the government from disposing of any parcels. Grazing and recreational use would continue to be allowed, and existing rights of way and leases would be honored during the two-year temporary withdrawal "as long as they do not conflict with the proposed withdrawal," the BLM said. BLM officials could not say what activities presently take place along the 300-mile route other than grazing. If DOE decides to proceed with the rail project after completion of an environmental impact study, its application would likely be narrowed to the actual acreage needed, BLM spokeswoman Jo Simpson said, adding restrictions for other uses would be determined in the final withdrawal order. Pre-existing grazing permits would be honored, she said. DOE spokesman Allen Benson said the land withdrawal application was routine to allow the department to develop its impact assessments within the corridor. An environmental impact study issued last year identified issues that DOE will likely confront along the corridor, which runs north toward Panaca and then west. It crosses north of the Nellis Air Force Range and then south, skirting the western edge of the range to Yucca Mountain, about 100 miles northwest of Las Vegas. The corridor study listed impacts to 740 acres of desert tortoise habitat and detailed the proximity of riparian areas where water quality might be affected. It numbered 97 recorded archaeological sites. DOE applied for a 20-year land withdrawal, which Simpson said was customary. She said DOE would need to apply for extensions to continue use of the land beyond that period. Halstead said the department is underestimating the job ahead. "They are talking about going through a range of mountain passes that are 4,000 to 6,000 feet," Halstead said. "I'm not sure the route they've laid out would be feasible without switchbacks and tunnels." Between the mountains, "you do have lots and lots of environmentally sensitive areas and a lot of difficult soils you are working on," Halstead said. "Add in the seismic issues and flooding issues and this is one hell of a good old engineering challenge to build this sucker." DOE spokesman Joe Davis said he would not respond to the assessment. "Halstead says a lot of things, most of which I find unnecessary to respond to with a comment," Davis said in an e-mail message. "Today is no different." Halstead also predicted private landowners will be poised to sue DOE for jeopardizing the value of developable property along the corridor. Michael Corradini, chairman of the Nuclear Waste Technical Review Board, sent a letter of resignation to the White House on Tuesday, telling President Bush that constant inquiries into his possible conflict of interest have taken away from the board's role in overseeing the Yucca Mountain Project. "Ever since I took on this position in June of 2002, the board staff and members have been required to respond to inquiries about perceived conflicts of interest and these distractions have created a huge burden on the board members and staff and diverted us from our proper oversight role," wrote Corradini, who is also the chairman of the engineering physics department at the University of Wisconsin-Madison. "It is my view that I do not have a conflict of interest nor are my professional activities as a university professor and researcher in nuclear reactor safety a source of potential conflicts of interest," he noted. Beyond the extra time spent answering these question, he also wrote that he is "concerned" about the effect even a perception of a conflict would "have on the public's trust in the board's oversight and review process." Conflict of interest questions surfaced in October when he co-wrote an editorial in a Wisconsin newspaper saying storing waste in Yucca can be done safely. An administrative panel of the Nuclear Regulatory Commission partially cleared the way for Private Fuel Storage to construct a rail line that would deliver spent nuclear fuel some 26 miles down the west side of Skull Valley, along the Cedar Mountains. The Atomic Safety and Licensing Board ruled against a Southern Utah Wilderness Alliance challenge that the rail line runs afoul of wilderness quality lands bordering the Goshute tribal lands. "We recognize that SUWA has worked diligently to preserve such values elsewhere in the state, but we must say that those values are neither apparent nor affected here," the three-judge panel wrote in a 61-page decision. Private Fuel Storage is a consortium of nuclear-powered utilities seeking to store up to 40,000 tons of spent nuclear fuel in aboveground canisters on Goshute tribal lands, 75 miles southwest of Salt Lake City. The consortium made a deal with Goshute tribal leaders in 1997 to lease 820 acres of the reservation to temporarily store the nuclear waste until a permanent storage facility opens up in Yucca Mountain, Nev.
Wednesday's ruling wraps up one of the last remaining issues the state and SUWA raised to put the brakes on nuclear waste ending up in Utah. The board still has to consider Private Fuel Storage's appeal of a March 10 ruling – a temporary victory for the state – on the issue of Air Force overflights in the western desert and the risks of jet crashes into the facility. The NRC then makes a final decision. The Eureka County Nuclear Waste Update is published by the Eureka County Yucca Mountain Information Office, P.O. Box 990, Eureka,NV 89316, (775) 237-5707. The purpose of the Update is to provide information to the public about issues related to the proposed nuclear waste repository at Yucca Mountain. The newsletter is funded by oversight funds provided to Eureka County by the U.S. Department of Energy. Articles in this newsletter may not necessarily reflect the positions or opinions of the Eureka County Board of Commissioners.